Unpredictable climate changes along the world’s most vulnerable coastal communities, have produced some fascinating design solutions that test the resiliency of architectural possibilities and the need for adaptation that will produce these changes. 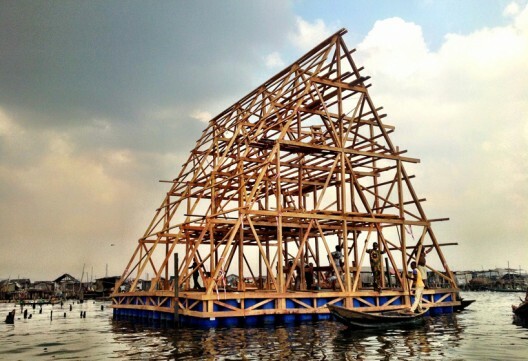 The coastal community of Makoko, a slum neighbourhood, off the Lagos Lagoon in Lagos, Nigeria, is receiving an upgrade to its current solution, which is building homes supported on stilts within the lagoon’s waters. 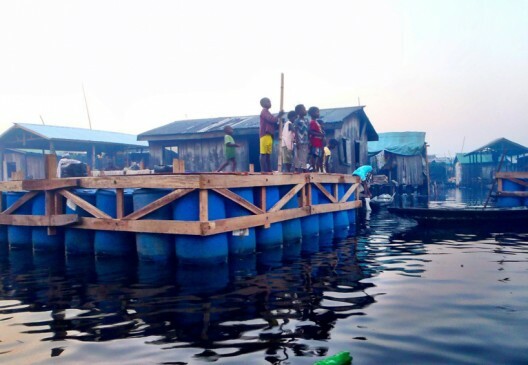 NLE Architects, with sponsoring from United Nations Development Programme (UNDP) and Heinrich Boell Foundation from Germany, designed the Makoko Floating School, phase one of a three-phase development that will become a floating community of interlocked and floating residences. Construction on the project began in October 2012 and was completed just last month with grand appraisal from the community and UN visitors. 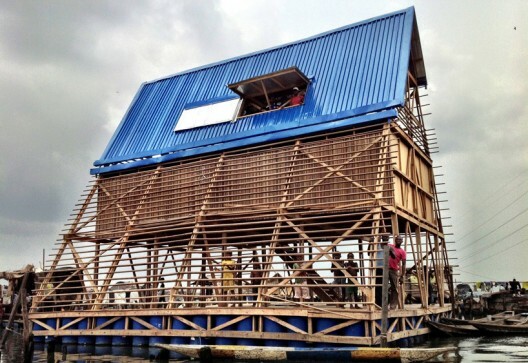 The Makoko Floating School and the total planned projects makes use of local materials and resources to produce architecture that applies to the needs of people and reflects the culture of the community. Wood is used as the main material as the structure, support and finishing for the completed school. The overall composition of the design is a triangular A-Frame section, with the classrooms located on the second tier. They are partially enclosed with adjustable louvred slats. The classrooms are surrounded by public green space, there is a playground below, and the roof contains an additional open air classroom. NLE has also employed strategies to make the floating architecture sustainable by applying PV cells to the roof and incorporating a rainwater catchment system. The structure is also naturally ventilated and aerated. But how does it float? The completed structure rests on a base of typical plastic barrels. This simple solution reflects a reuse of available materials that can provide multiple uses. The barrels at the periphery can be used to store excess rainwater from the catchment system. The second phase of the project will include the construction of individual homes that follow the same aesthetic as the school. These elements will be able to connect to each other or may float independently. Phase three will allow for the development a large community of floating architecture. 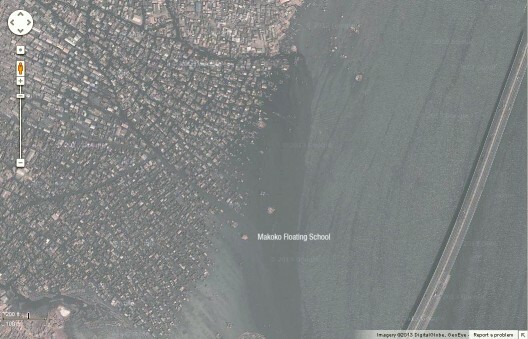 An aerial view of Makoko shows how less dense the homes become as the homes get further and further into the lagoon. The architecture, as it exists today, is supported on stilts. NLE’s vision will bring a new layer of homes, floating just beyond where the Makoko Floating School is indicated on the map. 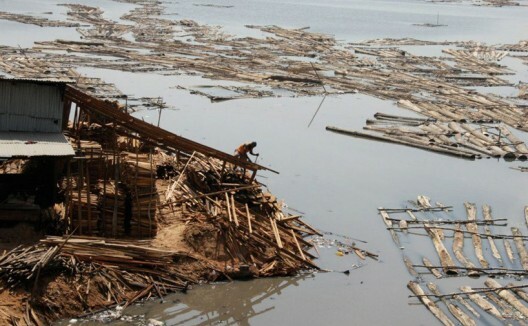 Largely a self-sustaining, self-governing fishing community, this past summer the Lagos government destroyed and evicted residents to seize property for redevelopment along the waterfront. What the future of Makoko will be is unclear – by political or environmental standards. But NLE’s design and development of a sustainable floating community and its UN support indicates that the community is looking forward to adapting a resilience to its architecture. 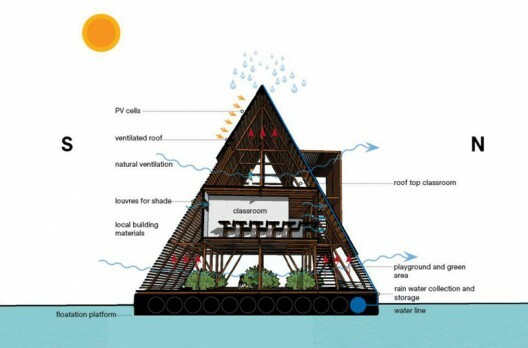 The Makoko Floating School is not the only project to develop a floating concept to combat unpredictable climate changes and global sea level changes. Last year, we presented the floating schools of Bangladesh supported by the non-profit Shidhulai Swanirvar Sangstha run by architect Mohammed Rezwan. Meanwhile, Dutch-based practice Waterstudio has developed numerous innovative solutions to building and designing offshore homes and developing emergency housing.